Maybe you have a tilted standing desk or a laptop tray that leans when on your lap – either way the problem is if your grips on the bottom don’t grab enough, your laptop will start sliding. When you’re typing on your computer or surfing the web, you don’t want your screen moving all over the place. 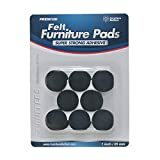 If you have this problem, try Furniture Buffers furniture pads. The benefits are several. First, the waffle design grips surfaces so unless your laptop is at a really steep angle, it’s going to grab to the surface and stay in place. Second, you’ll get more cushion for your laptop against hard surfaces. 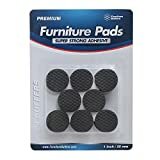 The rubber-foam composition of these grippy furniture pads absorbs shock and eliminates grind and wear and tear that can be tough on your laptop. Third – and this one’s a biggie – these little cushions lift your laptop up just enough to give it breathing room from the fan to the surface. You don’t want your computer flush against a surface because then the laptop fan can’t distribute the air as freely which causes it to overheat. However, if you put a buffer on each corner, all of a sudden air can flow and vent freely underneath computer. At the same time, the pads aren’t so tall that your hands will be displaced from comfortably typing. Bottomline, two big problems are solved. First, Your computer can ventilate on any hard surface which keeps it cooler and thus makes it last longer. Second, your computer won’t slide around or jostle while you’re trying to type on a smooth or decline surface. Grab a pack of buffers today at Amazon.